A synthetic floor that is manufactured from different profiles of HDF cores with one thing in common, a laminated photographic image or graphical top layer that is designed to give the finished look of wood or any desired effect. Laminate Flooring is the most popular choice of flooring because of the extensive range of colours and designs, it’s good value for money, hard wearing, easy to install and maintain. Browse our laminate flooring sale for the best offers and you can order a few samples to try before you buy. How are Laminate Floors made? Laminate Layer - The top layer is a scratch resistant, protective, transparent UV film that helps extend the durability of the floor. Core Layer - This is the largest composition layer made from HDF that gives the laminate flooring its thickness for strength and sturdiness. This is where the click grooves are constructed. 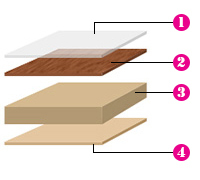 Base Layer - The bottom layer has moisture resistant properties and gives the floor added structural stability. Why you should choose Laminate flooring? There are plenty of benefits that make choosing a laminate floor easy. It’s a very popular floor thanks to its easy installation, low maintenance and smaller price tag compared to real wood. Unlike a solid or engineered option, laminate flooring is water resistant. This makes it ideal for any room in your property, including bathrooms, provided moisture is cleaned up quickly and planks are tightly laid to avoid water seeping to the core layer. Where natural materials would expand and contract, laminate floors also do not change in response to temperatures. This means they are also safe to lay in utility rooms and conservatories that experience fluctuations in temperatures throughout the year. Browse our range of laminate flooring sale and pick up a bargain today. If you can't decide then order a few samples of your choice to help you choose the right floor. How to buy a Laminate floor? The easiest way to shop for laminate flooring is online where you can start by browsing the shades of colour of laminate flooring that compliments your décor, filter by thickness or jump straight to a brand you prefer. We aim to make your online buying experience easy by offering the most trending laminate floors from the most reputable brands with easy to install click system features and matching accessories to give you the best value from our selection of floors online. If you can’t make up your mind, then you can order a free laminate flooring sample to see and feel the difference before you place your full order. We have one of largest held stock of branded laminate floors with over 350 different colours, style, range of thicknesses and widths, suitable for every room or purpose at the lowest prices guaranteed. Whether you’re looking for black, white, grey, silver, brown natural oak, light or dark oak flooring we have something that will closely match your required shade of colour. AC Rating, used for laminate floors, is a measure of a floors resistance to abrasion, impact, stains and cigarette burns. The ratings also indicate that the product has been tested for the effects of furniture legs, castors, and swelling along its edges. If a laminate flooring product has a rating, then it has passed all of the test criteria. Failing just one test will disqualify a product. AC4 – Suitable for busier homes that require more durable floors or commercial offices, receptions, salons, cafes and restaurants. AC5 – Areas with Heavy traffic such as high street retail stores and busier restaurants and cafes. 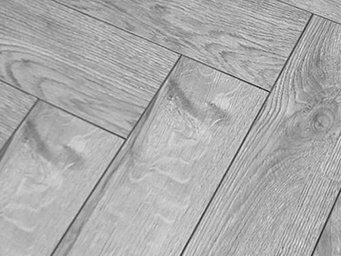 We have laminate flooring for all areas including water resistance and splash resistant floors suitable for installation in kitchens and bathrooms, scratch resistance for children bedrooms and play areas, UV protected floors for longer life in conservatories and areas that catch more sunlight than usual. Laminate floors use the easy click installation method. The click system means the planks simply fit together like a jigsaw without the need for any adhesive or additional joining methods. Care is almost non-existence unlike wood where you may need to treat or sand the wood down every so often but you should take general care and precaution for any floor to make it last as long as possible. Cleaning is easy with laminate floors. You can easily dust the surface using a soft cloth broom or if you have dried spillages you can clean with a damp cloth without having to scrub the floor. Hygiene can easily be maintained because its so easy to clean regularly. Allergy sufferers can be rest assured that laminate flooring can be maintained to one of the most dust free floors on the market. Most of our branded laminate flooring come with limited manufacturer warranty with up to 25 years from Quick Step and Krono brands. Please check manufacturer information for up to date warranty covers and their terms. As we stock all the floors we sell, they are ready to be dispatched on the same morning your order arrives meaning your order can be processed and dispatched the same day if you order a floor in stock before midday. All our laminate flooring sale products are competitively priced bringing you huge savings and value for money online. We buy in large bulk quantities direct from high standard and ethical European manufacturers to offer you the lowest possible prices without compensating on quality. Save more when buying laminate flooring online with free delivery on most items when you order over 15 packs or call us to order by phone. * Although we aim to price match all our advertised products most of our products are the cheapest you will find from any genuine flooring retailer on the web or on the high street. If we are not able to beat the price of a genuine like for like product we will endeavour to increase the value of your order by offering you close alternatives in some cases a better product, discounted laminate flooring accessories, save costs on delivery and a better service which combine to give you more value for money. * Free Delivery applies to England and Wales, on quantities of 15 packs or more on most products.